The follow up to the happier page. The two continue to not believe the other is real. Alexis, with other things going on in her life, isn't handing such an unpredictable figment of her imagination very well. 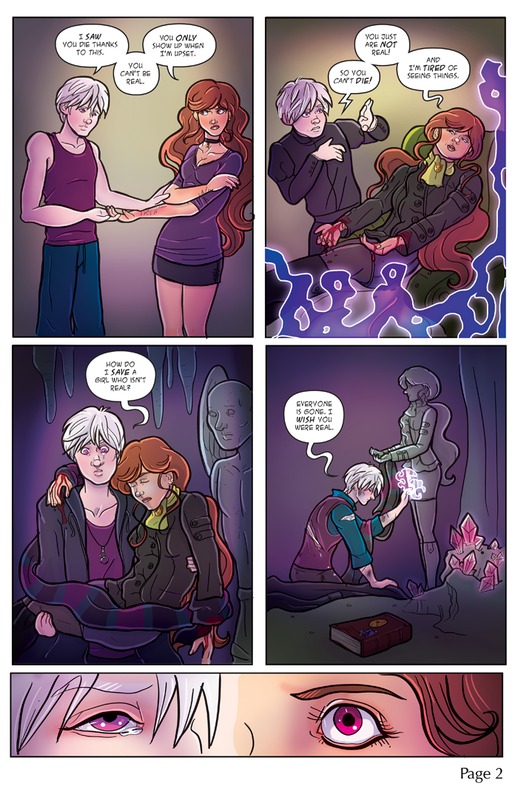 By the end of the page, Gavin is pretty well aware she's not so imaginary anymore (and has lost some things of his own), but now she's a statue ... the only way to save her? We don't get to see that part . Her eyes go from brown to burgundy, as a hint at where most abdals come from is shared - they are chosen. The question is, are they all chosen, purposefully or accidentally, by Gavin or is something else at play?